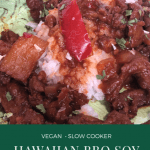 Make this recipe for Hawaiian BBQ Soy Curls in the slow cooker and pour over rice. 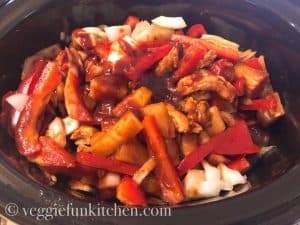 Slow cook the soy curls all day in a tangy BBQ sauce with pineapple, onions, and peppers. 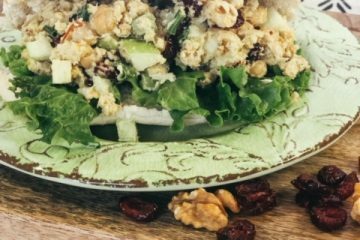 This vegan dish is perfect for when you want to come home to a delicious, healthy, protein-filled meal. 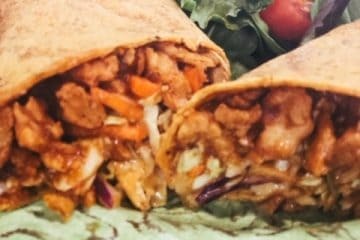 My first experience with cooking with soy curls was with my BBQ Crunch Wrap with Soy Curls recipe. My family loved that so much and asked me to make more. 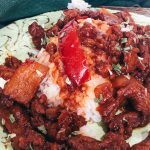 I wanted to make a recipe using soy curls over rice rather than a wrap. 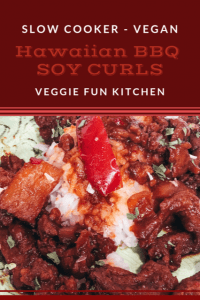 The recipe for Hawaiian BBQ Soy Curls is perfect with its mix of sweet and tangy flavors. Pin now to save for later. What are soy curls and how do you cook them? Soy curls are made only by Butler Foods. 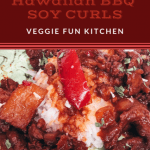 You can go to their website and find out a little more about soy curls and how they are made. They do not share the exact process they use though as this is proprietary information. They do assure us though that soy curls are made from the whole bean and are minimally processed. You will need to rehydrate the soy curls before cooking with them. Typically this means soaking in water for up to 20 minutes. 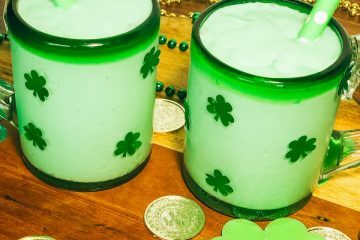 In this recipe, I just throw them in the slow cooker along with the liquid used and they rehydrate while they are cooking. 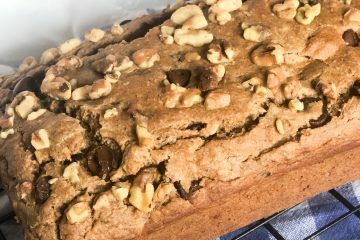 Read through all of these tips and tricks to ensure that your recipe turns out as fabulous as mine did! Use an 8-ounce bag of soy curls. There is no need to rehydrate for this recipe. Just throw them in a slow cooker. I get mine on Amazon.com by the 3-pack (affiliate link). Pour in the pineapple including juice from the can, BBQ sauce, teriyaki sauce, and vegetable broth. Top with sliced onions and bell pepper. 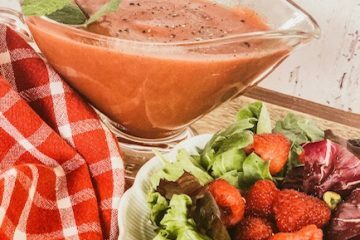 I used red bell pepper in this recipe, but you could use whichever color pepper you prefer. Give it a little stir and cook on low for 6 hours. Spoon on top of your favorite rice. I’m about the ease of preparation so I use prepared rice I buy at the grocery store. Anyone of these will do. Or make your own! 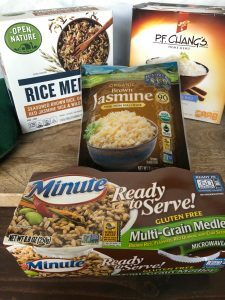 Use your favorite ready-made rice. 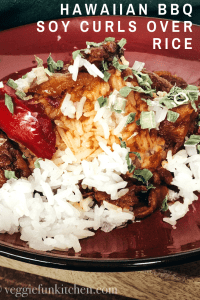 This recipe calls for 4 cups of rice which is 1/2 cup per serving. Use more or less depending on your personal preferences. You can serve over a baked potato instead of rice too. 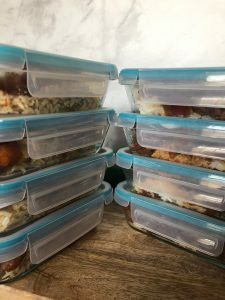 This recipe is great for meal prep. 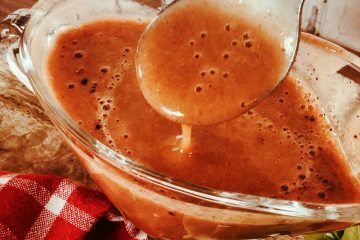 It makes 8 servings and can be kept in the refrigerator for up to five days. If it gets a little dried out, I just top with a little BBQ sauce. 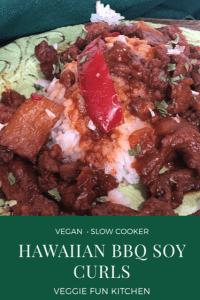 Hawaiian BBQ Soy Curls over Rice in meal prep containers and ready to go! *Amazon Affiliate* I am an Amazon affiliate. 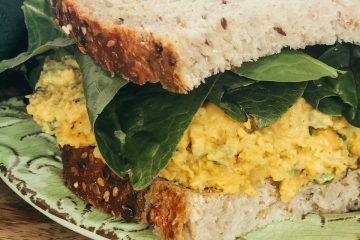 Clicking on and purchasing through one of these links might earn Veggie Fun Kitchen compensation at no additional cost to you. 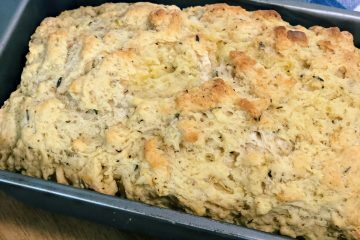 Thank you for reading through this recipe post and for being a part of Veggie Fun Kitchen. 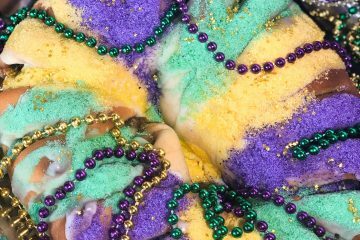 I hope you enjoy this recipe as much as my family did. If you liked the recipe, please let me know and five starts in the comments would be appreciated! 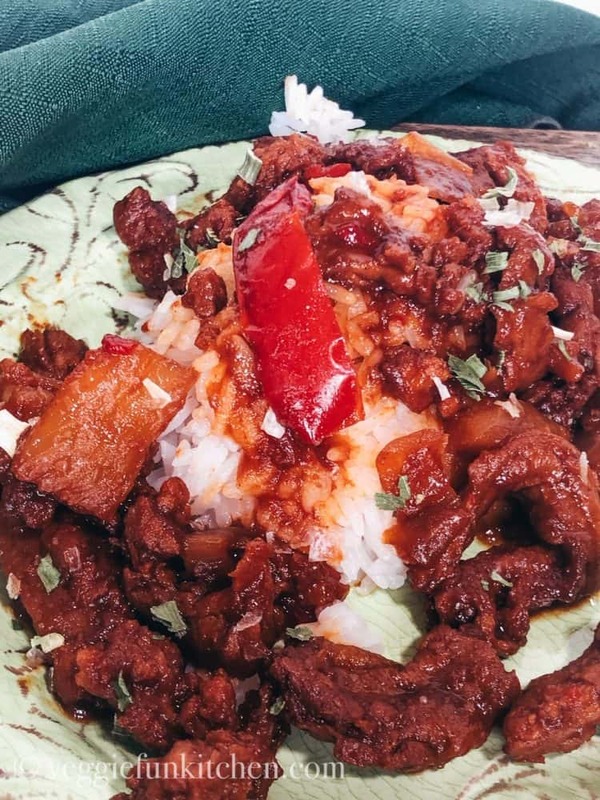 Soy curls cooked in sweet and tangy BBQ and Teriyaki sauce, topped with onions, peppers, cooked in the slow cooker and served over rice. Slice bell pepper and onion. Set aside. 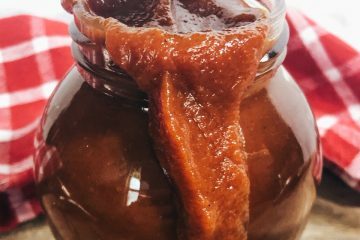 Put dehydrated soy curls in a crockpot. No need to rehydrate. Pour BBQ sauce, teriyaki sauce, and vegetable broth over soy curls. Add sliced onions and bell pepper. Give a little stir. Cover and cook on low for six hours. Use as a topping on rice or baked potato.